Nearly four years after holding a massive rally in Madison during his own presidential campaign, U.S. Senator John Kerry (D-MA) returned to the Capitol Tuesday. However, Bruce Springsteen was not with him this time. 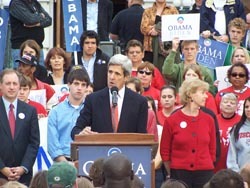 Instead, Kerry stood on the Capitol steps and urged voters to back Democratic presidential nominee Barack Obama. Kerry says voters don&apos;t need to wait until Election Day to show their support. He called on the several hundred people gathered to help keep the polls running smoothly on November 4th by voting early with their local County Clerk. Kerry says casting your ballot early keeps the line shorter on Election Day, allowing those with limited time to get their votes in. He says it also helps to fight any accusations of election fraud that could deny people their right to vote. The Massachusetts Senator says this election is too important to risk your vote.